Hi again! Katie here from View From The Fridge, and this month I’m back with a super simple and quick wreath. 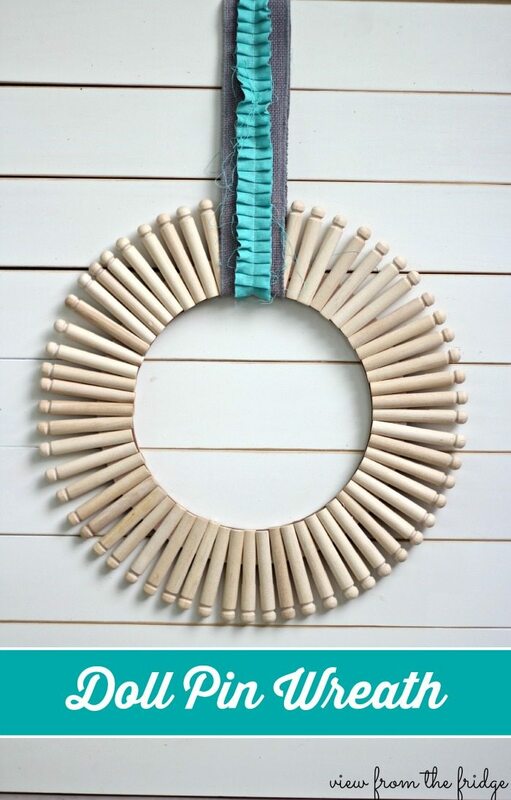 This Doll Pin Wreath is perfect for all seasons (including the quickly approaching Fall). I wanted something neutral for our front door. We have a yellow house, green roof, and bright blue planters on our front porch (with pink flowers). Needless to say, we have a lot going on. 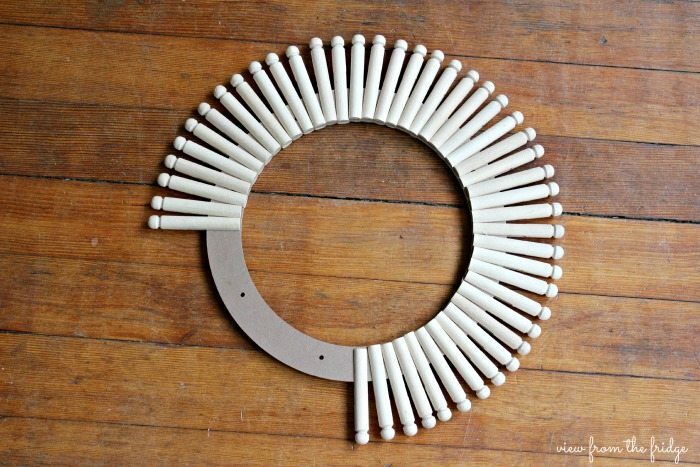 I wanted a wreath that was simple and neutral in color. I wanted a wreath that I could use across multiple seasons. And … I wanted a wreath that was inexpensive and quick to create (and also didn’t include faux flowers … just not a fan of those!). I’m starting to think about decorating for Fall this year (even though I desperately don’t want to say goodbye to Summer! ), and I think I’m going to go simple and neutral. Whites and greys, lots of natural elements, and just a couple very small pops of orange and turquoise. I’m not a huge fan of lots of bright oranges and yellows everywhere in the fall (in my house, that is! ), and I’m not a huge fan of decorating inside for Halloween. 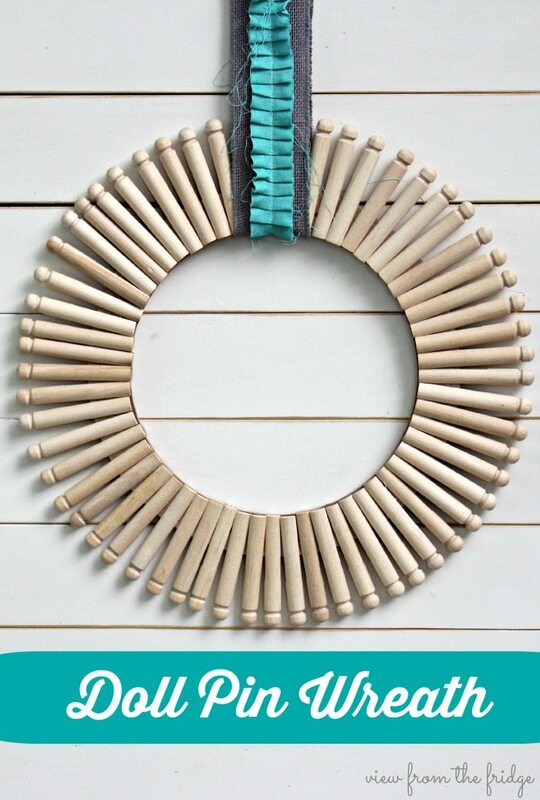 This wreath fits right into my vision for my decor this year; natural elements, neutral, with just a pop of color! And, the best part??? It takes only about 15 minutes to create (which is also key for me amongst the craziness of three little boys running around our house). Floral ring found at any craft store. I used a 12″ ring. 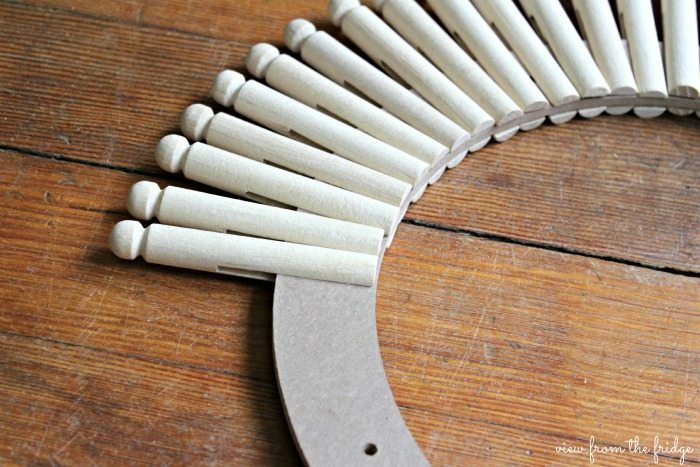 THREE packs of Wood Doll Pins – 25 pieces each (I had to go back to Michael’s after this picture was taken … ugh!). 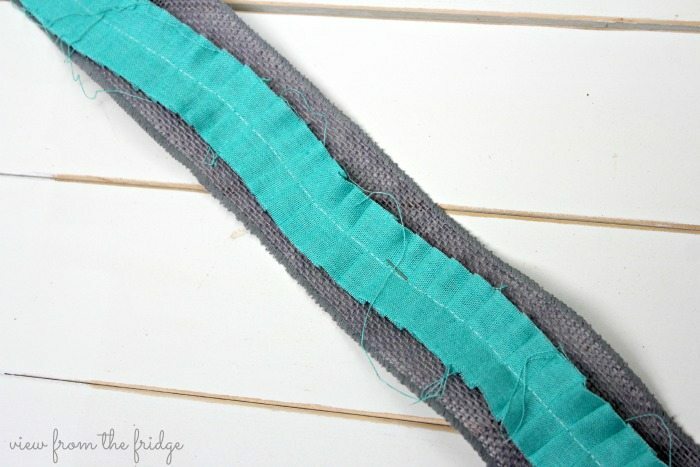 Ribbon, Burlap, Fabric, etc to hang wreath. You could totally stick with the natural and neutral vibe here and stick with JUST a strip of burlap, jute, raffia, etc. I picked up some grey burlap and turquoise pre-ruffled fabric from Michael’s. Simply start sliding your doll pins onto the floral ring one at a time. Tip: do this slowly, as they fit tight (this is good), but could crack if you jam them on there too quickly. 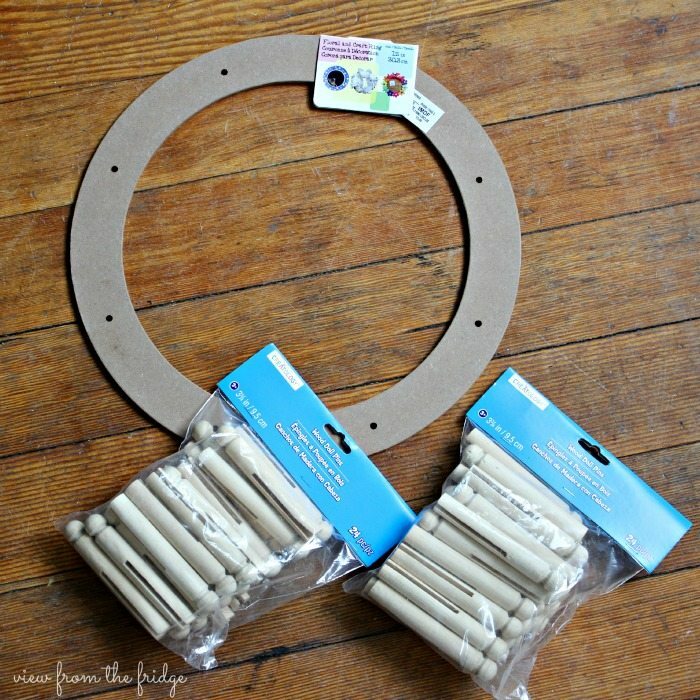 Cut your ribbon, burlap, fabric, etc for the wreath hanger. 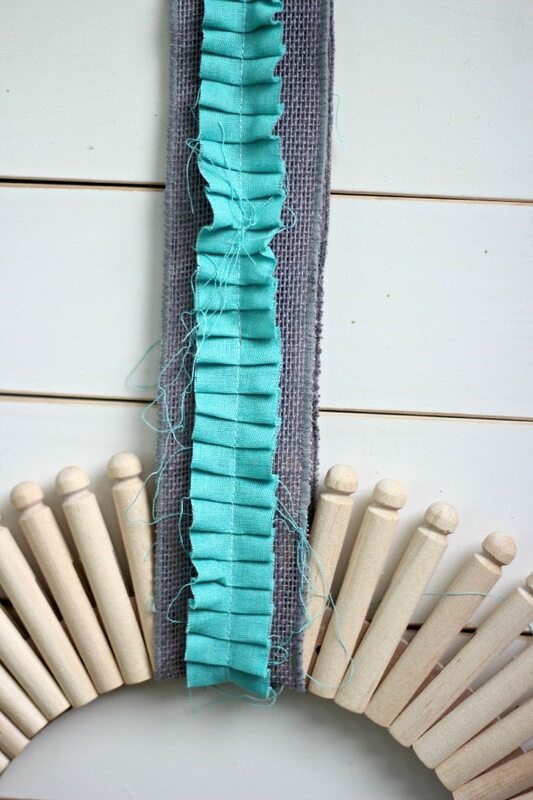 I used a 2″ roll of grey burlap with a ruffled turquoise fabric on top. I simply pinned them together. I wanted to easily be able to switch up the colors as the seasons change. 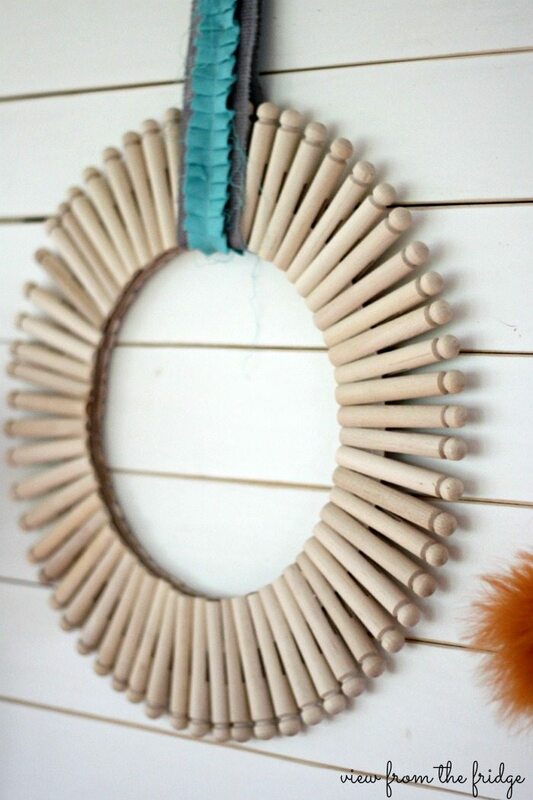 Loop it around your wreath, and hang it up! 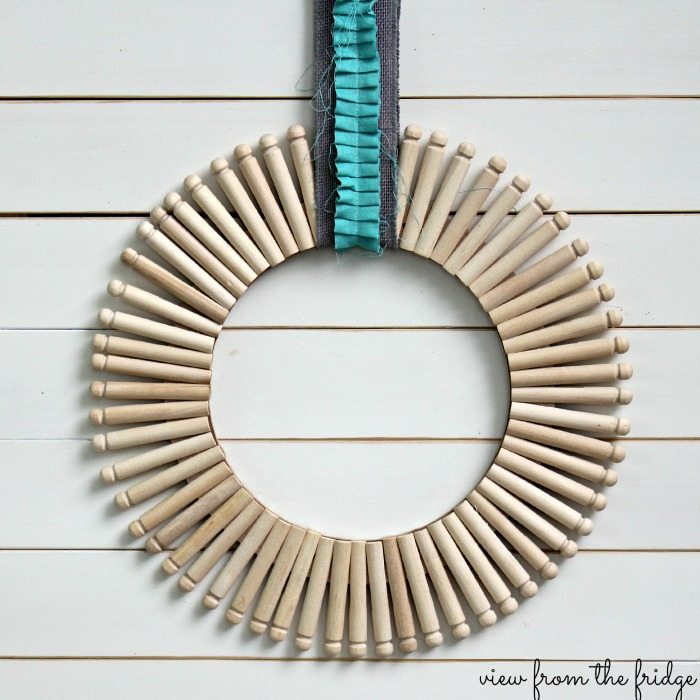 If you’re looking for a little more color on your wreath, the options from here are endless! Add some fabric flowers (or real flowers! ), add a colorful bow, switch up the ribbon, add a mini bunting across the center with ‘hello’ or ‘welcome’, paint the whole wreath, or … tape off some stripes and spray paint! Like I said, however, I’m going for a simple look here, so I hung it up AS IS, and I love it! Thanks, Erin!! You could totally make one for your house in some fun color by just spray painting the whole thing afterwards! 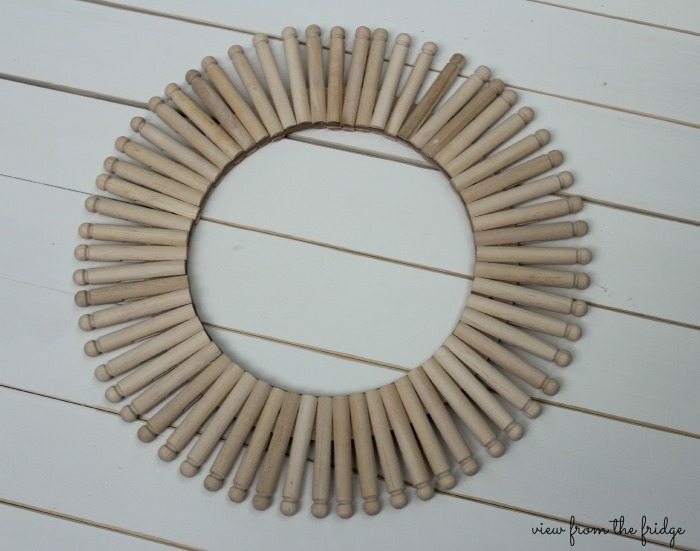 It seriously was the easiest wreath I’ve ever made … 15 minutes tops! Thanks for stopping by! What a stunning and versatile wreath! You could change out the ribbons for the season, or make one for each holiday and paint the doll pins accordingly. Thanks so much, Raina, I really appreciate your sweet comment! I was just thinking that I kinda want to paint it white … or grey. Hmmm. But, yes, the ribbons would be totally easy to switch out for the seasons! Thanks for stopping by, and for the comment! I love how easy this wreath was to make!! I’m all about a quick and easy project. I can’t wait to see what your Fall decor looks like. Thanks, Courtney! I am very slowly decorating for Fall around here! I just can’t believe Summer is over! Thanks for stopping by! Thanks so much, Catherine! I was hoping to use it year round (or until I get sick of it!). Hope you had a wonderful week!